Yoga has been used to cure a vast array of maladies throughout the ages but modern science is now proving time and time again that yoga is even better for you than we originally helped. There are certain poses that help with relaxation, breathing, exercise and even digestion! Check out this must have pose for digestive help. Even yogis need a little help in the digestion department from time to time. Fortunately, Kathryn Budig says calling on the right pose at the right time can help. I like to think of The Squatty Potty as the lazy person’s Malasana (Gina Caputo was the first person to suggest pulling your feet up onto the toilet seat like Malasana in times of need). This low squat is the digestive system’s hero. It puts everything into perfect alignment for easy elimination. Try holding this pose for a minute (or longer) first thing in the morning — or whenever you need some help — getting your system going. Start standing with your feet slightly wider than your hips. Turn your heels in and toes out, pointing your knees point in the same direction as your toes. Drop down into a full squat. (If this is too intense on your knees, you can place a block under your hips.) Either place your hands on the floor for support or snuggle your triceps to the inside of your thighs and join your palms together in front of your heart. Press your palms together to fire your arms, which will give you a bonus hip opener. 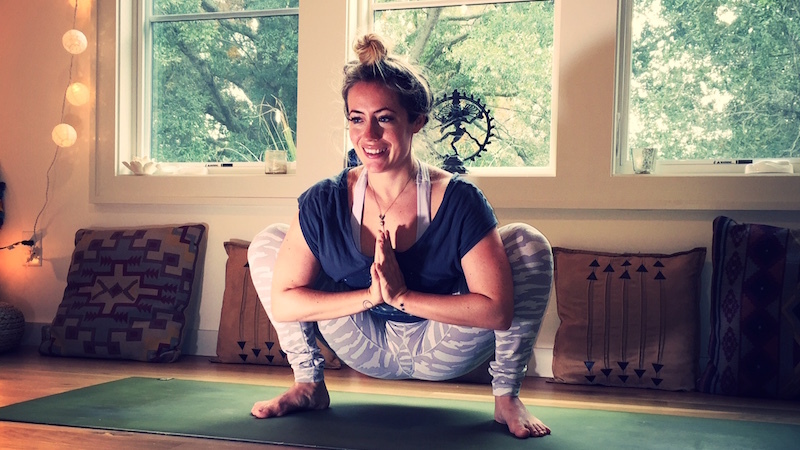 Kathryn Budig is the yoga teacher behind AIM TRUE, a regular writer for Yoga Journal, and a presenter at Yoga Journal LIVE! Her organization Poses for Paws raises funds to support animal shelters through yoga events. She shares the moments, places, and people that motivate and move her with #findyourinspiration. Discover what inspires her here in challenging asana, feel-good flows, and tips and tricks of the trade to help you advance your practice. Still having tummy troubles? Find more poses to ease digestion.